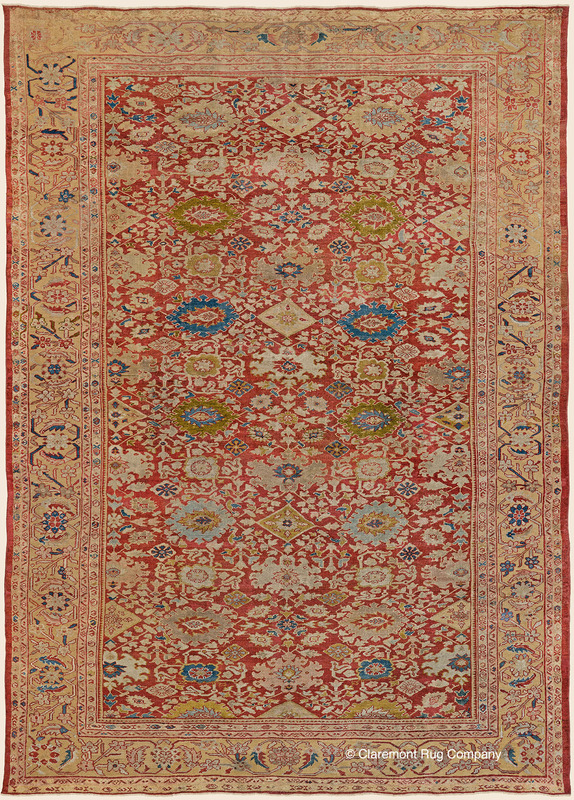 Search Our Inventory / All Rugs / 9&apos; 8" x 13&apos; 10"
9&apos; 8" x 13&apos; 10"
Great visual interest, sensitive design harmony and sublime color ways unite our 3500-piece collection, as this very special Sultanabad carpet demonstrates. This carpet exemplifies the top tier of High Decorative rugs, where a rarely-seen marriage of field and border tonalities create an arresting impact. The interior palmettes, diamonds, and smaller stylized plant forms are all individually drawn, imbuing an engaging organic quality to the overall design. Still in very good condition for floor use, this large room size Persian carpet with its arresting combination of its soft gold border and aged crimson field is meant to elevate a memorable space.